After delaying for a couple of years (yes, strangely there is other priority in my life, besides this blog post series) – I am finally putting a couple of the notes on the partitioning for the Columnstore Indexes. Even though this blog series is not a stranger to the Partitioning subject with 4 blog posts referring Columnstore Indexes – part 14 (“Partitioning”), Columnstore Indexes – part 15 (“Partitioning Advanced”), Columnstore Indexes – part 94 (“Use Partitioning Wisely”) & Columnstore Indexes – part 103 (“Partitioning 2016 vs Partitioning 2014”), but the practical (and not the performance) aspects & specifics of working with the Columnstore Indexes were always on my todo list until this very blog post. In this blogpost I will want to focus on 2 of the most common operations over the Partitioned tables, the MERGE & the SPLIT, because there are some little specifics that will affect your DWH, once you migrate it to Columnstore Indexes over from the Rowstore ones. To test the partitioning scripts, please download the free ContosoRetailDW database, at Microsoft’s page. Let us add 5 new file groups (1 for the pre-2007 data, and then for each of the years 1 data file (2007,2008,2009,2010). MERGE clause of ALTER PARTITION statement failed because two partitions on different filegroups cannot be merged if either partition contains columnstore index data. Splitting partitions – an easy task that you shall never face at the very last moment, when some team forgot to do their job at the end of the year, for example. For the purpose of the demo, if you have merged the year 2009, please re-run the setup section before proceeding. SPLIT clause of ALTER PARTITION statement failed because the partition is not empty. Only empty partitions can be split in when a columnstore index exists on the table. We can not split a non-empty partition, when working with Columnstore Indexes ! There are workarounds, such as taking out the data out of a partition, splitting it and then reloading data into the respective partitions, but this does not sound like a fun procedure, when we could simply issue 1 command to split the range, but this is something that everyone working with Columnstore Indexes should be aware. Keep a good empty partition free from any data. Set it to unrealistic dates/values if needed, so that you are playing safe. If you are a consultant and landing on the migration project from Rowstore to Columnstore, keep in mind that it might require a different amount of work, if the partitioning practices of having empty partitions is not well kept. Rowstore is different to Columnstore and the internals do matter, making the learning curve a very interesting/challenging for everyone. 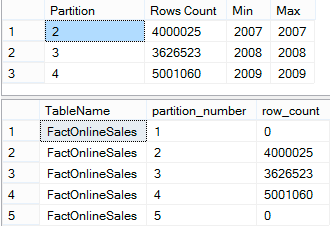 Partitioning is available in every single edition (yes, including Standard Edition), starting with SQL Server 2016 Service Pack 1, meaning that this feature will be finding an increased usage in the nearest months, and if you are working with Data Warehousing and your fact tables are in the 100s of millions of rows, there are few reasons why your tables should not be partitioned. We can not have every feature in Columnstore Indexes that we have had in the Rowstore, simply because the technologies are sufficiently different and a huge effort of implementing a feature that is not a makeIt/BreakIt for the most SQL Server shops is something that will stay for a long time like this. This has been this way since the original SQL Server 2012 release and 4 versions later I do not remember people crying about it in the way that this would be considered life-changing. Surely it’s the point of the partition function/scheme to control the boundaries. Why would the columnstore index itself have to be involved in the MERGE at all? Rowgroups don’t span partitions, do they? Couldn’t SQL Server just move the rowgroups from the merged partition into the destination partition? I realize that may result in suboptimal compression but it would be as good compression as having the two separate rowgroups in two separate partitions. What you have described is absolutely correct, but consider the fact that this code will need to support queries that are reading information (avoid loosing rows, avoid scanning them for the second time), and allowing other data modification queries (inserts, deletes & updates) – this will look quite a challenging task, given that the framework should have it own limitations. I believe that partitioning code is largely written for SQL Server 2012 and they were quite in a hurry to wrap it up before release.